FOUR LEAF CLOVER RING The four leaf clover is one of the most common good luck symbols of the Western world. 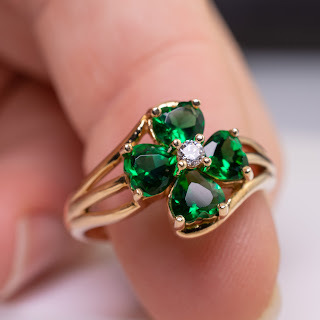 A beautiful lucky clover ring with lab emeralds and colorless cubic zirconia made in 9k yellow gold. The striking ring displays a center colorless cubic zirconia which is surrounded by four heart-shaped lab-created emeralds. The clarity of the stones is just stunning. To add further style, the shoulders are split into thee and twist around the flower setting.